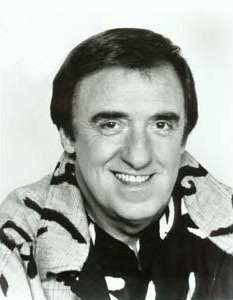 Jim Nabors was a singer almost as soon as he could talk. He sang in his church choir, and joined the glee club in high school. He briefly worked as a typist at the United Nations in New York, but eventually drifted to California, where he worked as a film cutter at NBC by day, singing in nightclubs after hours. He was discovered in 1962, singing at a Santa Monica nightspot called The Horn, when Andy Griffith came in for drinks. Griffith, though, was more impressed by Nabors' banter between songs than with his singing, and he asked Nabors to audition for a one-time appearance on his top-rated Andy Griffith Show. On camera, Nabors was a natural, and he became Gomer Pyle, perhaps the dumbest hick in Mayberry but perpetually possessed of a cheerful disposition. Nabors' appearance on Griffith's show was very well received, and Pyle became a recurring character on the show. He was eventually spun off to his own sitcom, Gomer Pyle USMC, where the hayseed Pyle never got past boot camp, and was always hollered at by his hilariously furious drill sergeant Frank Sutton. The show was lowbrow funny and innocent, and fairly enlightened for a military sitcom that aired during the Vietnam war. One episode showed hippies in a positive light, and another episode had Nabors-as-Pyle singing Bob Dylan's peace anthem "Blowing in the Wind." The series ran for five years, ending in 1969, and to this day Marine drill instructors often refer to recruits who need extra training and extra shouting as "gomers." Nabors was, of course, delighted with the show's success and his own fame, but this was not the career he wanted. He still wanted to be a singer. On the strength of his Gomer Pyle fame, he was given a weekly variety show on CBS, singing and performing comedy on The Jim Nabors Hour. A good friend of Carol Burnett's, he was the guest star in the first episode in each of The Carol Burnett Show's eleven seasons, and he was a full-fledged cast member when her show was revived in 1991. In the mid-1970s he starred as Fum, opposite Ruth Buzzi as Fi, in the bizarre Sid and Marty Krofft kids' show The Lost Saucer, and he had supporting roles in three of his friend Burt Reynolds' 1980s movies, but for the most part Nabors has been a singer, not an actor, since the early 1970s. He has a rich, booming, almost operatic baritone voice, built for Sinatra-style standards, not for rock or pop. His easy listening hits include "Help Me Make It Through the Night," "Try To Remember" from The Fantasticks, and "The Impossible Dream" from Man of La Mancha. He had several successful albums in the 1960s and '70s, recorded dozens of albums over his long career, and was often booked in Las Vegas showrooms. His most bizarre album was Shazam, in which Nabors sang a dozen songs in Gomer Pyle's high-pitched hillbilly voice. For most of his career Nabors was perpetually single, and never known for any romantic life, which fueled rumors about his sexuality. In the early 1970s, he was widely whispered to be "secretly married" to Rock Hudson. Nabors vehemently denied that Hudson was anything more than a friend, and Hudson also shrugged off the rumors, albeit less emphatically. As recently as 2000, a spokesman for Nabors denied that the star is gay, but in a 2005 article about gay stars in the St Petersburg Times, Nabors was cited as gay alongside such out icons as Robert Reed, Paul Lynde, and Charles Nelson Reilly. In 2013 he married his boyfriend of 38 years, Stan Cadwallader. He came close to death in 1994, but underwent a liver transplant, regained good health, and resumed his singing career. Nabors, now in his 80s, lives in Hawaii, where he owns a macadamia nut farm. The stretch of U.S. Highway 280 near his hometown of Sylacauga, Alabama, has been re-named the Jim Nabors Highway. In 2001, in a full-dress ceremony overseen by Gen. James Jones, commandant of the US Marine Corps, the fictional Gomer Pyle -- Nabors, in uniform again -- was promoted to Lance Corporal. In the Marines' seemingly-serious press release after the event, it was described as "a no-nonsense ceremony." Keoki Kerr, "Actor Jim Nabors Marries His Longtime Male Partner", Hawaii News Now, 29 January 2013: "I'm 82, and he's in his 60s, and so we've been together for 38 years, and I'm not ashamed of people knowing, it's just that it was such a personal thing, I didn�t tell anybody."